Snapdeal in its new updated android app giving flat Rs. 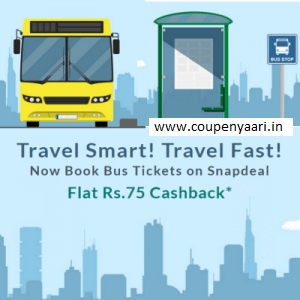 75 cashback on bus ticket booking. Now book bus tickets on Snapdeal and get flat Rs. 75 cashback in your freecharge wallet. Offer is valid for all bookings made between Apr 27 – Apr 30 (both dates included). Travel window should be between Apr 27 – May 15 (both dates included). No promo code needed. Every booking made during the offer duration will be eligible for the cashback. Cashback of Rs 75 will credited to the user’s Freecharge wallet account on May 20. Please create a Freecharge wallet account if you do not have one and use your registered phone number for making the booking. Get Rs. 75 cashback in your freecharge wallet by May 20.